Coke causes up to 50 % of the costs during the hot metal production. The cost effective production of high quality coke is thus of prime importance for the competitive ability of the iron production. Metallurgical coke is used in iron and steel industry processes (primarily in blast furnaces) to reduce iron ore to iron. Over 90 percent of the total coke production is dedicated to blast furnace operations. Foundry coke comprises most of the balance and is used by foundries in furnaces for melting metal and in the preparation of moulds. Foundry coke production uses a different blend of coking coals, longer coking times, and lower coking temperatures relative to those used for metallurgical coke. Most coke is produced in the world using the byproduct coke oven batteries and most of the coke plants are integrated with iron and steel production facilities. The manufacture of coke by heating coal in absence of air has its origins at the start of industrial revolution when Abraham Darby used it in the smelting of iron ores in 1709 in England. The method of coke production was initially the same as for the production of charcoal, stockpiling coal in round heaps, igniting the piles, and then covering sides with clay. This laid the foundation for beehive coke making. Gradual advances led to the development of beehive, reverberatory and byproducts ovens, culminating into regenerative coke ovens with recovery of the byproducts around a century ago. Coal is converted to coke in large coke oven batteries by the destructive distillation of coal. The coking process consists of heating coal in the absence of air to drive off the volatile compounds. The resulting material is a carbon mass called coke which is a hard, but porous carbon material. The byproduct coke oven recovers volatile matter of coal in the form of coke oven gas, tars, and oils. Heat recovery or energy recovery coke ovens. These coke ovens are also sometimes called non recovery coke ovens. Byproduct coke making process involves carbonization of coal at high temperatures in an atmosphere where there is no oxygen. The process removes volatile matter of coal and concentrates the carbon. In this process the off gas is collected and sent to the byproduct plant where various byproducts (coke oven gas, tar, ammonia, and crude benzol) are recovered. A byproduct coke oven plant has three main sections namely coal handling plant and coal preparation section, byproduct coke oven batteries with facilities of coke quenching, and coke crushing and sorting plant. 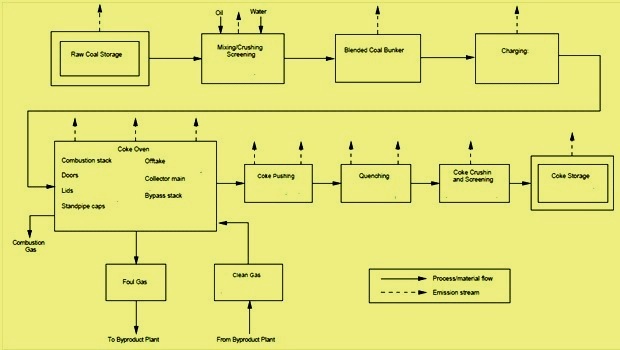 Typical process flow and emission streams of a byproduct coke oven plant are shown in Fig 1. Coking coal is an important raw material in the production of coke in the byproduct coke ovens since it decides the coke properties. The required coke properties are uniform size, good strength (CRI, CSR and micum values), porosity with minimum volatile matter and minimum ash. The coal that is charged to the coke ovens is usually a blend of two or more of coking coals. Blending is required to control the properties of the resulting coke, to optimize the quality and quantity of byproducts, and to avoid the expansion exhibited by certain types of coal that may cause excessive pressure on the oven walls during the coking process. Coal handling plant and coal preparation section prepare coal blend suitable for carbonization. Various steps involved are unloading and storage of coal, blending of coal of various grades, coal crushing and transport to coal storage tower. Conveyor belts transfer the coal from coal storage as needed to the mixing bins where the various types of coals are stored. The blended coal is transferred from the mixing bins to the coal crusher where it is pulverized to normally a size of -3 mm. The pulverized coal is then mixed and blended, and sometimes water and oil are added to control the bulk density of the blend. The prepared coal blend is transported to the coal storage tower on the top of the coke oven battery. Coal needs to be stored at various stages of the preparation process, and conveyed around the coal preparation section. Crushing and screening are the important part of coal handling plant. Crushing reduces the overall size of the coal so that it can be more easily processed and handled. Screens are used to ranges the size of coal. Screens can be static, or mechanically vibrated. Coke ovens are the chambers made of refractories to convert coal into coke by carbonizing coal in absence of air and there by distilling the volatile matter out of coal. Byproduct coke oven plant consists of one or more coke oven batteries containing number of coke ovens (can vary from 20 to 100 in each battery). The coal is charged to the coke oven through charging holes. Typical cross section of a 7 m high coke oven battery is shown in Fig 2. A weighed amount of coal is discharged from the coal storage tower into a charging car, which is the charging vehicle that can travel the length of the battery. The charging car is positioned over the empty, hot oven, the lids on the charging holes are removed, and the coal is discharged from the hoppers of the charging car into the oven. To minimize the escape of gases from the oven during charging, steam aspiration is used to draw gases from the space above the charged coal into the collecting main. The discharge of coal from the hoppers is ‘staged’ by controlling the sequence in which each hopper is emptied to avoid peaks of coal that may block the space above the coal, which hinders the removal of gases generated during charging. Near the end of the charging sequence, peaks of coal in the oven are leveled by a steel bar that is cantilevered from the pusher car through a small door on the side of the oven, called the leveler door. This leveling process aids in uniform coking and provides a clear vapour space and exit tunnel for the gases that evolve during the coking process to flow to the gas collection system. After the oven is charged with coal, the leveling door is closed, the lids are replaced on the charging ports and sealed (luted) with a wet clay mixture, the aspiration is turned off, and the gases mixture, the aspiration is turned off, and the gases are directed into the off take system and collecting main. The transformation of coal to coke starts taking place. The heat is transferred from the heated brick walls into the coal charge. From about 375 to 475 deg C, the coal decomposes to form plastic layers near each wall. At about 475 to 600 deg C, there is a marked evolution of tar, and aromatic hydrocarbon compounds, followed by re-solidification of the plastic mass into semi-coke. At 600 to 1100 deg C, the coke stabilization phase begins. This is characterized by contraction of coke mass, structural development of coke and final hydrogen evolution. During the plastic stage, the plastic layers move from each wall towards the centre of the oven trapping the liberated gas and creating in gas pressure build up which is transferred to the heating wall. Once, the plastic layers have met at the centre of the oven, the entire mass has been carbonized. The incandescent coke mass is pushed from the oven and is wet or dry quenched. The thermal distillation takes place in groups of ovens called batteries. A battery consists of a number of adjacent ovens with common side walls that are made of high quality silica and other types of refractory brick. The wall separating adjacent ovens, as well as each end wall, is made up of a series of heating flues. At any time, half of the flues in a given wall are burning gas while the other half are conveying waste heat from the combustion flues to a ‘checker brick’ heat exchanger and then to the combustion stack. Every 20 to 30 minutes the battery ‘reverses’, and the waste heat flues become combustion flues while the combustion flues become the waste heat flues. This process provides more uniform heating of the coal mass. 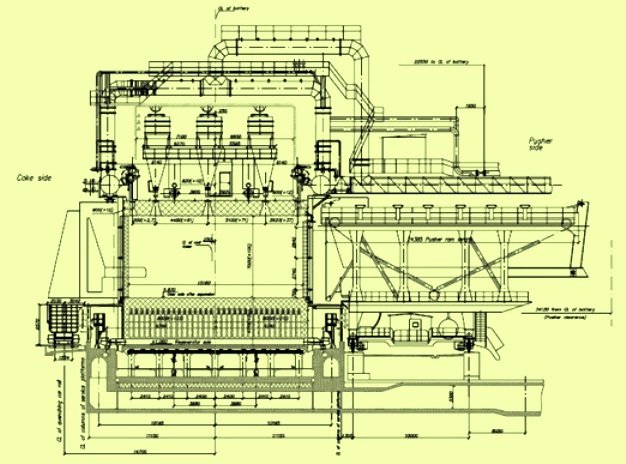 The operation of each oven is cyclic, but the battery contains a sufficiently large number of ovens to produce an essentially continuous flow of raw coke oven gas. The individual ovens are charged and emptied at approximately equal time intervals during the coking cycle. Coking proceeds for 15 to 18 hours to produce blast furnace coke. During this period, volatile matter of coal distills out as coke oven gas. The coking time is determined by the coal blend, moisture content, rate of under firing, and the desired properties of the coke. When demand for coke is low, coking times can be increased to 24 hours. Coking temperatures generally range from 900 to 1100 deg C and are kept on the higher side of the range to produce blast furnace coke. Air is prevented from leaking into the ovens by maintaining a positive back pressure in the collecting main. The ovens are maintained under positive pressure by maintaining high hydraulic main pressure of around 10 mm water column in batteries. The gases and hydrocarbons that evolve during the thermal distillation are removed through the off take system and sent to the byproduct plant for recovery. The coking is complete when the central temperature in the oven is around 950-1000 deg C. At this point the oven is isolated from hydraulic mains and after proper venting of residual gases, the doors are opened for coke pushing. At the end of coking period the coke mass has a high volume shrinkage which leads to detachment of mass from the walls ensuring easy pushing. The control of oven pressure is quite important because lower pressure leads to air entry while higher pressure leads to excessive gassing, leakage of doors, stand pipe etc. Proper leveling of coal is important and care is taken so that free board space above (around 300 mm) is maintained to avoid choking. At the end of the coking cycle, doors on both ends of the oven are removed and the incandescent coke is pushed from the oven by a ram that is extended from the pusher machine. The coke is pushed through a coke guide into a quenching car. The quenching car carries the coke to either a wet quenching tower or dry quenching plant where it is cooled. The quenched coke is taken by conveyor to a crushing and screening plant also called coke crushing and sorting plant. Here the coke is crushed and screened to the required size fractions. During crushing and screening, coke is sorted in three size fractions. These are coke breeze (size – 10 mm), nut coke (size +10 mm to – 25 mm) and blast furnace coke (+25 mm to – 80 mm). The sized blast furnace coke and nut coke are transported to their respective storage systems at the blast furnace. The coke breeze is sent to the sinter plant.